Beck: Alright, continuing with the covers, this is an old Daniel Johnston song. Do you play his music? KCRW DJ: Not that much... I know who he is and we've got some records. He doesn't get played that much on the radio anywhere. Probably a little bit here. Beck: Yeah, this is a song I always loved. It's called "Some Things Last A Long Time." Daniel Johnston is a songwriter from Austin, mostly known for making homemade tapes in the '80s. He wrote emotional, poignant songs (like this one) and weird ones (some of his song titles include "I Save Cigarette Butts" and "She Called Pest Control"). 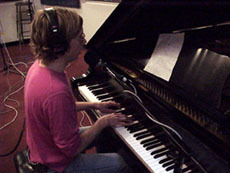 The humor and sound and general atmosphere of the songs were extremely similar to Beck's early work. This song can be found on his album, 1990, which Beck has dipped into for covers numerous times. Anyway, it's easy to see why Beck would like this song so much. It's highly emotional, but still with a little fun wordplay and flair ("It's funny, but it's true / and it's true, but it's not funny," for example). Beck, while making his annual stop in at KCRW in 2000, didn't really have anything to promote. So he did a bunch of sad, melancholy covers; among them this amazing, heartwrenching song. Beck is sitting at a piano and singing, which is not something you hear Beck do often! He plays piano like he does other instruments...not with virtuosic fluency, but with enough emotion to get the point across. As evidenced from the picture above, he was reading the lyrics off a piece of paper. For more information on Daniel Johnston, check out Hi! How Are You?